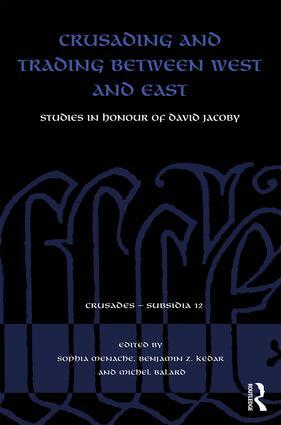 For almost sixty years Professor David Jacoby devoted his research to the economic, social and cultural history of the Eastern Mediterranean and this new collection reflects his impact on the study of the interactions between the Italian city-states, Byzantium, the Latin East and the realm of Islam. Contributors to this volume are prominent scholars from across Medieval Studies and leading historians of the younger generation. The Use of Paper in the Frankish Levant: A Comparative Study. Thomas Morosini, First Latin Patriarch of Constantinople (1205-1211): A Re-Appraisal. Eine Bleibulle Tankreds von Antiochia? Richard of Cornwall’s Treaty with Egypt, 1241. The Redemption of Philip of Courtenay, Heir of the Empire of Romania (1259). Une phase décisive d’intenses tractations diplomatiques entre sultanat mamlûk et puissances occidentales (couronne d’Aragon, républiques de Gênes　et de Venise)　687/1288 – 692/1293. The Architectural language of the Hospitaller Church of St. John, Acre, and its Historical Context. New documents on Genoese Famagusta. The Latin Will of a Jewish Burgensis of Rhodes, 1448. Les derniers sceaux de plomb commerciaires byzantins. Venice: Money for the Salvation of One’s Soul and the Solace of One’s Subjects. The Donation made by Pietro II Orseolo in 1007. Kaviar am Hochzeitsbankett: Die Vermählung der Agnes-Anna von Frankreich mit Alexios II. Komnenos (1180) und das Prodromos-Petra-Kloster in Konstantinopel. In the heart of Asia: Marco Polo, from Venice to Tibet. Remarks on the Settlement of Peasants from Patmos in Venetian Crete. Independent Women in Candia’s Giudecca: The Testaments of the Two Eleas. North-South, not Just East-West? An Understated Nexus of Byzantium before and during the Crusading Era? What is a ciguda/ciguta? On the Venetian Navigation in the Azov Sea in the Fourteenth-Fifteenth Centuries. "Gold of Cyprus" and Other Gold Threads in Late Medieval England, 1300−1450. Sabatino Russo, a Jewish Merchant of Lecce: Challenges of Transregional Interfaith Joint Ventures around 1400. Medieval Silk Textiles from Excavations in the Land of Israel. Silk from the Sea: Byssos, Ṣūf, Sea Wool. Sendal-cendal-zendado. The Silk Cloth woven in the Development of the Silk Industry in Italy )12th- 15th Centuries). Where the Silk Road Met the Wool Trade: Venetian and Muslim Merchants in Tana in the Late Middle Ages. Sophia Menache is Professor Emerita at the University of Haifa. She has studied the history of the Military Orders with special emphasis on the Knights Templar and the communication aspects of the crusades. She also published three books on medieval communication, propaganda and stereotypes, and many articles on the interrelationship between humankind and pets, especially dogs, from the ancient period up to the end of the Middle Ages. She served as secretary of the Society for the Study of the Crusades and the Latin East between the years 2002–2009. Benjamin Z. Kedar is Professor Emeritus of History at the Hebrew University of Jerusalem. He is the founding editor of Crusades and former President of the Society for the Study of the Crusades and the Latin East (1995–2002). He also studies comparative and world history: most recently, he co-edited Volume 5 of The Cambridge World History. Michel Balard is Professor Emeritus of Medieval History at the University of Paris 1 Panthéon-Sorbonne. Agrégé d'histoire, late member of the French School at Rome (1965–1968). Maître de conférences at the University of Paris 1 (1968–1976), Docteur ès-lettres (1976), Professor at the University of Reims (1976–1988), at the University Paris 12 Val-de-Marne (1988–1991), at the University Panthéon-Sorbonne (1991–2004), and former President of the Society for the Study of the Crusades and the Latin East (2002–2009).